I'm so thrilled to share with you my latest quilt finish. The pattern is from Trish Poolson at Notes of Sincerity for Moda Bakeshop. Trish is a dear, sweet friend of mine that I got to meet right before our move. When I saw the pattern I knew I wanted to use the charm packs I had of Aneela Hoey's "Sew Stitchy". The pattern is great for beginners and also for more experienced quilters who want to play with pattern and color. The pattern is very well written and easy to follow. I highly recommend it. 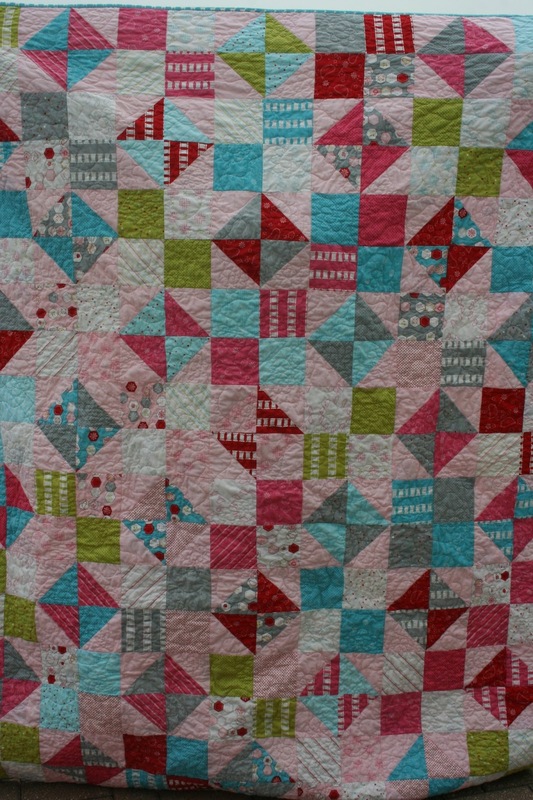 I love Trish's quilt using "Avalon" by Fig Tree Quilts. 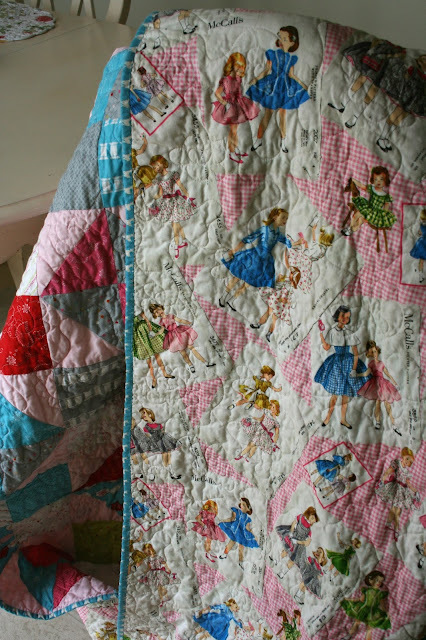 I backed the quilt with a fun retro sewing pattern fabric I had in my stash which I purchased a couple years ago at JoAnn Fabrics. The binding is "Oh Deer" by Mo Mo for Moda Fabrics. A thank you to Mary my quilter/friend for her great quilting and a big thank you to Maddie, my daughter for holding the quilt up but didn't want to be photographed (nice sunglasses, dear daughter). 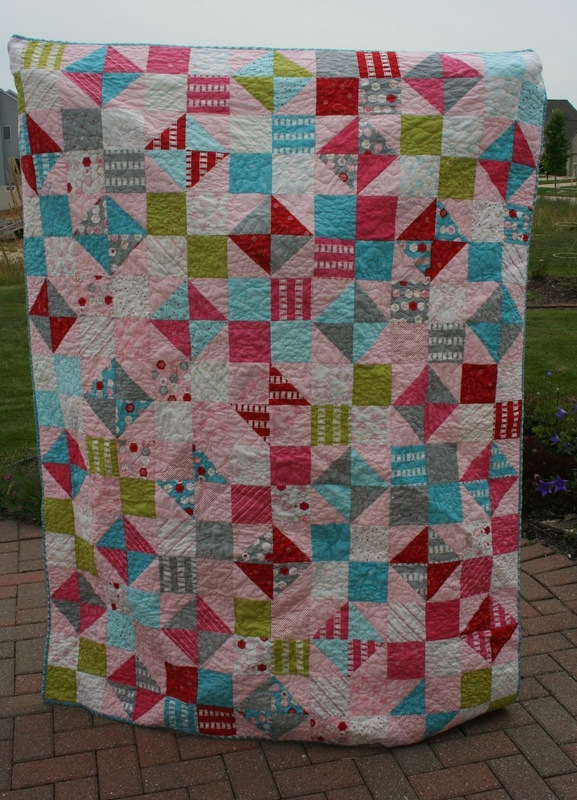 Your quilt turned out gorgeous, I just love the fabric you used on the back. Trish is such a sweet heart. That pattern in on my to do list. The colors are very pretty and retro. Cute backing fabric! I love the backing fabric. So charming. 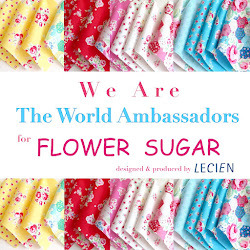 Adorable and I absolutely LOVE the backing fabric! Nice job!! Your quilt is gorgeous and so is your daughter! I love the backing too :) great quilt finish! 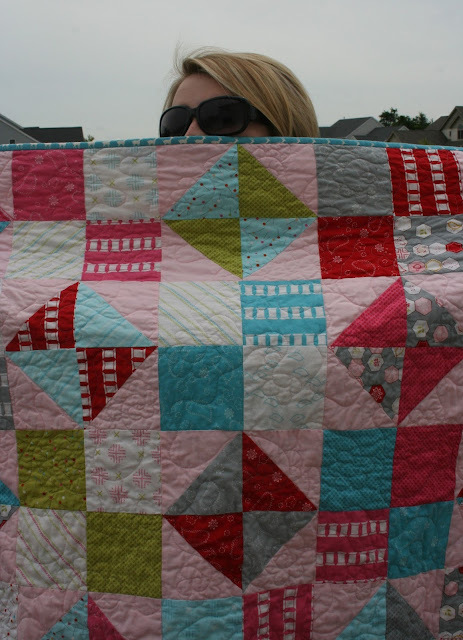 Your quilt is so adorable Renee!! Im so glad you liked my pattern!! Love the quilt. Such pretty colors. I love the backing. Did you order the backing? A really great finish! I love Aneelas fabrics. I should get another layer cake of this line. Hi Renee! Saw the name of your blog, and had to come visit. Your quilt is sooo lovely. I am a wanna be quilter who has a whole quilt in my bottom drawer in squares waiting to be sewn together! One of these days! I use all different types of fabrics in my creations, but my faves are vintage. Just lovely:>) I would love to try this one myself!